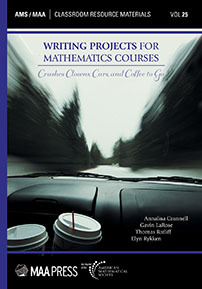 Writing Projects for Mathematics Courses is a collection of writing projects suitable for a wide range of undergraduate mathematics courses, from a survey of mathematics to differential equations. The projects vary in their level of difficulty and in the mathematics that they require but are similar in the mode of presentation and use of applications. Students see these problems as real in a way that textbook problems are not, even though many of the characters involved (e.g. dime-store detectives and CEOs) are obviously fictional. The stories are sometimes fanciful and sometimes grounded in standard scientific applications, but the mere existence of the story draws the students in and makes the problem relevant. After reading through the book, I decided to try one of the projects in my Mathematics for Elementary Teachers class … Although the problem was completely fabricated, the students enjoyed the project and, judging by their submissions, learned to apply the necessary mathematics as well. … I am encouraged by the results I saw with just this one project. … Experienced instructors will find that this book is a source of new projects, possibly requiring a new writing style.